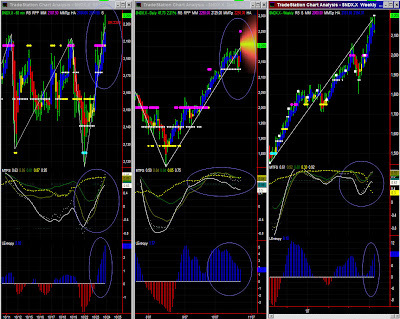 Lower time frames indicate still some slight upward bias to 820, but RUT could also reach 828(stronger MM + Fib). MTFS is not looking too bad but Entropy has peaked already. Significance level is now much lower. Despite yesterday's up day, and contrary to lower time frames, the daily chart still points downward, and this is the dominant time frame. One may have some congestion since we have Fib + MM level at 812. Caution must be exercised, at least until a new Fib formation appears clearly. In such case, one may see a target more clearly (781?? or 862??). Entropy is looking good, but MTFS indicates continuation of this situation of congestion with an upward bias. 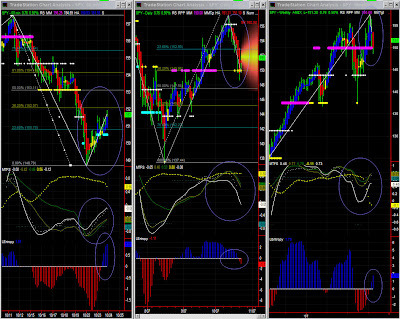 Lower time frames indicate some slight upward bias, and SPY could well reach Fib PR1 or even 153 (MM+ Fib). MTFS is not looking too bad but Entropy could peak shortly. Significance level is lower. Despite yesterday's up day, and contrary to lower time frames, the daily chart still points downward, and this is the dominant time frame. One may have some congestion since we have Fib + MM level at 150. Caution must be exercised, at least until a new Fib formation appears clearly. Weekly: mildly UP - Very low significance level. Entropy is looking good, but MTFS indicates continuation of this situation of congestion. The Swing indicator is trying to turn down, so one may just be close to a key level. The method cannot detect sudden shocks to the system, but can adapt to them and evaluate subsequent directions and levels. In this case, after an 'exuberant' open, NDX broke pivot level and went up to 2188, but to our surprise, that level also broke fairly easily. MTFS and Entropy are bullish, so the next resistance level may just be 2250. We'll have to watch for the 'stall' level if prices move to fast (~2134).No visible Fib pattern to provide any other scenario at the moment. Daily: Up, hopefully at a slower pace. Amazing bounce on 2125. NDX is overbought, and each retracement so far has failed. Entropy is however declining, so one may just try and reach 2250 (or prior stall level). Weekly: mildly UP - Low significance level. Entropy is looking good, but MTFS has difficulty adapting to such a strong run. 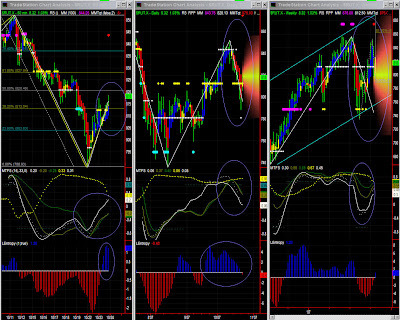 We therefore have 'waves in overbought zone' which may justify looking at a higher time frame.